Australasia’s richest competition for young opera & classical singers, featuring the Marianne Mathy Scholarship (‘The Mathy’). The IFAC Handa Australian Singing Competition (ASC) evolved through a bequest in the will of the late Marianne Mathy-Frisdane, an operatic soprano and distinguished teacher who trained many well-known Australian singers. Since 1982 MOST® has provided opportunities for career development by offering within this Competition awards, scholarships, prizes, and education and performance opportunities for Australasian singers under the age of 26. The Competition itself is a rigorous three-stage process in which pre-eminent Adjudicators from the Australian and international singing and music fraternity hear entrants as they compete in the Heats, Semi-Finals and Finals. Over three decades thousands of young singers from Australia and New Zealand have participated in the Competition and many have gone on to pursue successful careers in Australia and overseas including established singers such as Stuart Skelton and Rachelle Durkin and emerging talent such as Nicole Car and Jessica Pratt. 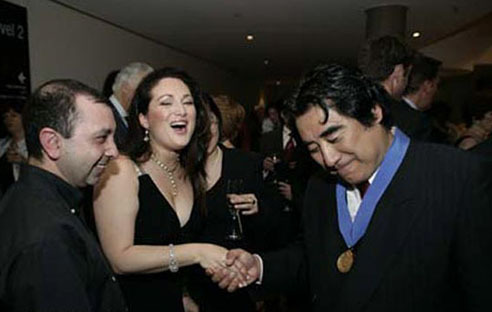 As Patron of the IFAC Handa Australian Singing Competition, Dr Haruhisa Handa has underwritten the cost of an orchestra accompanying our Finals Concerts since 1998. Through the support of Dr Handa and his International Foundation for Arts and Culture (IFAC) the Competition has matured into an internationally respected event, with Heats held across Australia, New Zealand and the UK and Finals Concerts in Brisbane, Melbourne, Perth, Sydney and Adelaide. "I wholeheartedly support the Australian Singing Competition...a wonderful launching pad for young classical singers." 2019 IFAC Handa Australian Singing Competition Finals Concert will take place on Thursday 19 September at The Concourse, Chatswood. MOST® presents the ASC annually. We are proud to offer nearly $200,000 in prizes and opportunities to our participants.